To all who are interested in Angels in our lives!!! 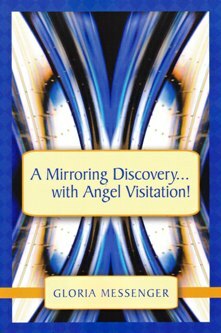 This feed-back and reviews are coming in on the book, A Mirroring Discovery with Angel Visitation: I would be delighted to add your personal endorsement of this book.... for a pay-it-forward momentum! I have five chapters left to read and am enjoying the book very much, it is nice to know that I am not the only one that thinks love is unconditional I got chills when I read that. It is very inspiring it really eases the mind and body and really makes me really wonder if my Angels ever try to communicate with me and I just do not realize it. Things that I normally would not do - is that the Angels trying to tell me something? I will let you know more when I finish the book. P. M.
Beautiful ... WOW ! I am on Chapter 7 - started last night to read it while listening to my self-hypnosis music, just before going to bed. That was a great experience, very relaxing because I started to fall asleep while reading - that was ok. This morning I read again and made some wonderful discoveries for my self, from your experiences....Rosemary Evangelista, Women Empowered Magazine. Amazing ... I can’t put this book down. It answers so many of my long unanswered questions. I want 5 more copies of this amazing book to give to special friends.... Roxsane Rysdae, The HeaLthy Self, Niagara Falls, ON. This book was very different--I will need to read it again to get more from it as I am not used to the language of the angels. Here is what I would say on first reading: “A Mirroring Discovery" invites the reader to think of themselves as a team comprised of Mind, Ego, Body, and Soul all needing to work together in this life adventure. Before we come to this earth, we plan an "itinerary" or general outline of what we want to experience here. The book is a review of Gloria's own life interspersed with nuggets of inspiration and wisdom from The Angels of the Light. It is comforting to know that love, guidance and assistance from the angels is available to anyone who asks for it.... L. A.
I am enthralled with your book. I find I read it slowly as it creates so many thoughts and feeling I need to process the information and its relevance to my life. Wow! Great material. I am also using your gift page markers as I mark a section to discuss it with my friends for their interpretation. We have had some great conversations of the spiritual nature which is a whole new topic between us. You book has enhanced our friendship. Words can not express my gratitude for all you do for me. Your book, my name analyze and Angel portrait inspire and remind me daily I have the choice to rejoice and not be ashamed to spread my joy. Glad to see you are out & about promoting your wonderful book. I am on my second read of your book now - I am awestruck! Several of your experiences resonated with me and the first 3/4's of the book just flew by - the last 1/4 seemed to take me longer - like I didn't want it to end. I think I was having information overload. There is certainly a lot of intriguing experiences that you had and perhaps I am not quite ready for all the information that was there. Now, I am in the process of rereading & making notes. A much slower process. Stay well - hope to see you at your next event. Love Light & Laughter, Rosemary Evangelista, Women Empowered Magazine. Glad to see you are out & about promoting your wonderful book. I have read your book once now - I am awestruck! Several of your experiences resonated with me and the first 3/4's of the book just flew by - the last 1/4 seemed to take me longer - like I didn't want it to end. I think I was having information overload. There is certainly a lot of intriguing experiences that you had and perhaps I am not quite ready for all the information that was there. Now, I am in the process of rereading & making notes. A much slower process. I wanted to finish rereading your book before submitting a testimonial about my Angel Portrait . . .
Gloria's book - A Mirroring Discovery . . . with Angel Visitation! - is helping me to piece together the puzzle of my life journey. There are many pages to mention and one jumped out to me. Gloria had presented me with my Angel Personal Portrait and a message from my Angels said:. . . do offer to you parallel steps in each approach you choose. . .It is a line up of FOUR. . .
For the next 3 years I looked for 4 choices. Then while rereading her book for the second time on page 217 the Angels said: emotions are placed in groups of four - and then the Angels explain the four choices. Ahhhhh! I had been looking for four choices of cars, clothes, earrings, chairs - whenever conundrums were presented and lo and behold it is a choice of an emotional action or reaction. How empowering. Thank you Gloria for saying YES. Thank you the ALL for the guidance. Amen.